The SCSI Report LUN command (opcode A0 h) requests for logical unit inventory accessible to the I_T nexus on which command is being sent. The logical unit inventory is a list that shall include the logical unit numbers of all logical units having a valid PERIPHERAL QUALIFIER value. Below is the CDB format of this command. The SELECT REPORT field specifies the types of logical unit addresses that shall be reported. d) Extended logical unit addressing method. 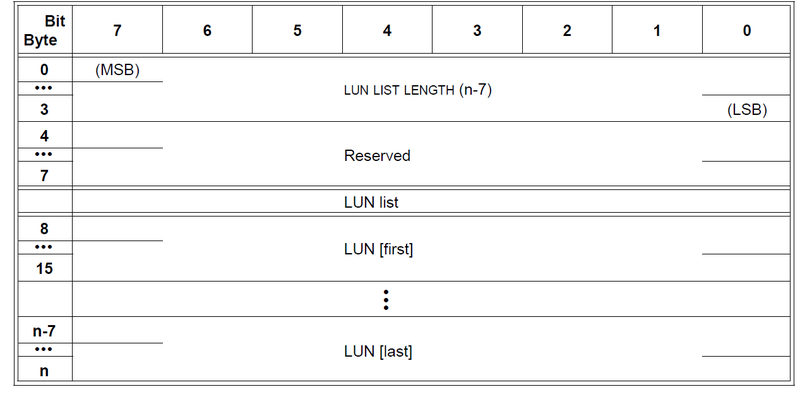 If there are no logical units, the LUN LIST LENGTH field shall be zero. logical units, the LUN LIST LENGTH field shall be zero. The list shall contain all logical units accessible to the I_T nexus. The ALLOCATION LENGTH field specifies the maximum number of bytes or blocks that an Initiator has allocated in the Data-In Buffer (result buffer). The SCSI device should report logical unit inventory using below format. 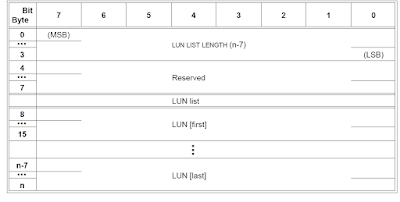 The LUN LIST LENGTH field shall contain the length in bytes of the LUN list that is available to be transferred. The LUN list length is the number of logical unit numbers in the logical unit inventory multiplied by eight.